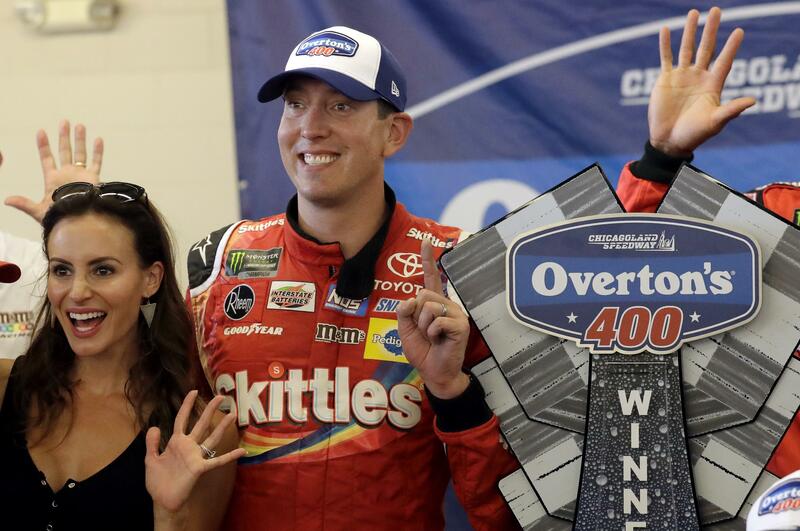 Sun., July 1, 2018, 9:26 p.m.
JOLIET, Ill. – Kyle Busch outdueled Kyle Larson on a wild final lap Sunday in the NASCAR Cup Series race at Chicagoland Speedway, earning his fifth victory of the season. It was Busch’s second win at Chicagoland, joining his victory in 2008. It also was win No. 48 for his career, matching Herb Thomas for 14th on the Cup Series’ list. Busch was booed by the crowd when he got out of the car. But Larson felt it was a fair finish. “I roughed him up. He roughed me up. That’s racing,” said Larson, who was trying for a weekend sweep after winning the Xfinity Series race on Saturday. Harvick was third, followed by Truex and Clint Bowyer. Truex was trying for his third straight victory at Chicago. Published: July 1, 2018, 9:26 p.m.